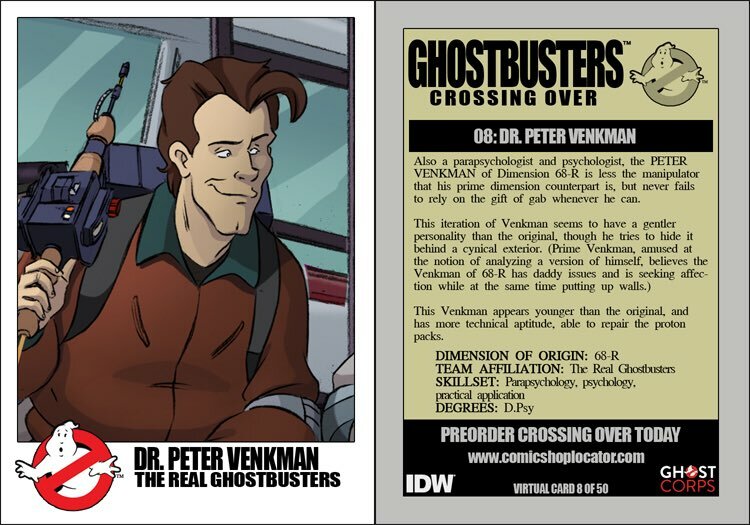 Also a parapsychologist and psychologist, the PETER VENKMAN of Dimension 68-R is less the manipulator that his prime dimension counterpart is, but never fails to rely on the gift of gab whenever he can. This iteration of Venkman seems to have a gentler personality than the original, though he tries to hide it behind a cynical exterior. (Prime Venkman, amused at the notion of analyzing a version of himself, believes the Venkman of 68-R has daddy issues and is seeking affection while at the same time putting up walls.). This Venkman appears younger than the original and has more technical aptitude, able to repair the proton packs.